This funky Blue Banana Fur Pom Pom hat has been designed to not only keep you cosy this winter but to also ensure that you stand out everywhere you go. 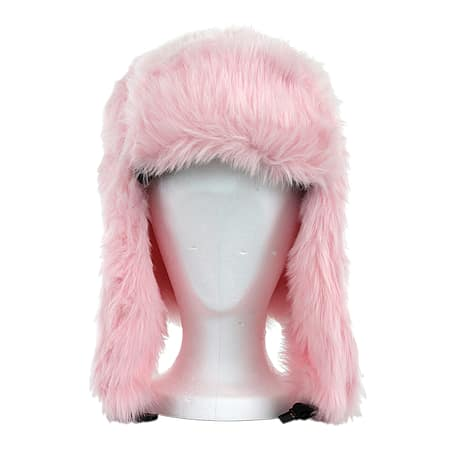 Covered in fur, this pink hat has a look that is perfect for winter. With flaps to cover your ears and a soft lining, there is no doubting that when you are wearing this hat you will feel ultra-comfy no matter what you are doing. The cold months are upon us and the only way you are going to stay warm is with this thick hat. Made with 100% polyester, this hat definitely has a comfortable shape you will rely on. Complete with long lasting durability, you can wear this funky hat year after year without the worry of it becoming damaged. Clipping up under your chin, this hat will sit perfectly on your head, ensuring that every part of your head is cosy. Giving you more than style, this Blue Banana Fur Pom Pom hat is definitely the choice for any winter wardrobe.